Each week in your regular foursome, it is fairly easy to put together a game to spice up the round—provided everyone shows up. If one player is missing, suddenly your planned four-ball game is unworkable. So you need to have a few golf games to play with an odd number of players (as opposed to a number of odd players, which is something else altogether). You are in luck; there are plenty of golf games for odd numbers to choose from for that weekly wager. Skins is perhaps the most commonly known game for any number of players. The lowest score on a hole (it can be gross or net) wins the hole. Each hole is assigned a point value (that can be translated to money), and holes carry over if there is a tie. So, it’s best to use handicaps and go with the net version of this game — especially if you are playing against someone such as Phil Mickelson (who is pretty good and likes to bet big). This game is sometimes called “bingle bangle bungle,” can be played with an odd or even number of players (two, three or four). In the game, three points are awarded on each hole for a bingo, a bango, and a bongo. A bingo is awarded to the player who first gets their ball onto the green (players who are furthest out take the first shot, and so on, which can reward the players with higher handicaps). The player whose ball is closest to the pin after each player is on the green wins the bango for that hole. And a bongo goes to the player who holes out first. Points can be double if a player sweeps all three — and you don’t want to “bungle” your shots and have that happen. In this game, there are six points available for each hole. If a player wins the hole outright, they are awarded four points. The second best score on the hole gets two points and the third zero. If one player wins and the other two halve the hole, the scoring is awarded 4-1-1 — or 3-3-0 if the two players who halved the hole beat the third. Handicaps are recommended for this one. You’ve likely heard of this scoring method, as the pros have used it for the Barracuda Championship in the past. Points are awarded based upon your score on each hole: one point for a bogey, two for a par, three for a birdie, four for an eagle and five for an albatross (although that doesn’t seem like enough points if you get one of those rare birds). The highest total for the round wins. It may be counterintuitive, but it’s fun. This is a game of fourball better ball match play that is played with three actual golfers and one imaginary player, called the ghost. One player on each hole elects to play with the ghost, who pars every hole (it’s like playing with Ben Hogan). The ghost plays off a scratch handicap and gives strokes, accordingly. The game works best when the highest handicapper in the group plays with the ghost. Hopefully, this one doesn’t come back to haunt you. This game is played in standard stroke play format, so it’s best if all members of the group either have an established handicap or are close to the same skill level. Each hole has nine points available for awarding. If all three players tie on a hole, each player gets three points. If one player wins the hole and the other two tie, the winning player gets five points and the other two are awarded two points each. If one player wins, another is a stroke behind, and the third player is behind second place, the winner gets five points, second place receives three points, and one point is awarded for third. Nassau is an important game to know since it is uncomplicated and very popular. It’s a betting game in which the players split into two teams, set a dollar amount per nine, and have a match for the front, back, and total. It is a very versatile game in that it can be used in nearly any format including stroke play, scramble, best ball, or match play. And the action can get crazy when the presses (when a match is closed out and the loser presses for double or nothing) and re-rolls start happening. This game is similar to games going by the name of Wolf or Lone Wolf. The captain on each hole (which rotates) hits his or her tee ball and then watches the remaining four players hit their drives. 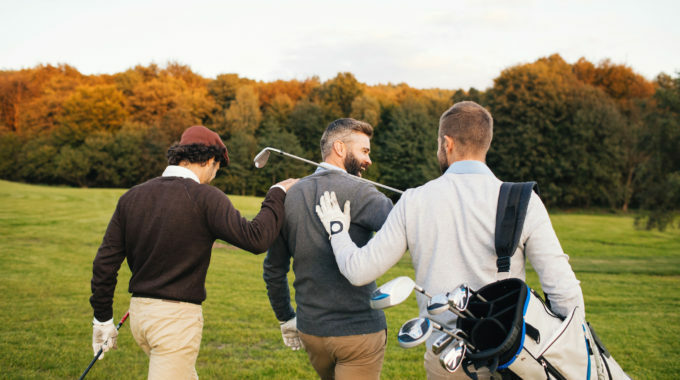 The captain chooses a teammate, but once another player hits their drive, the opportunity to choose the previous player and their drive is lost. When the captain picks a teammate, it is a game of two players versus three (with the worst player’s score of the three-person team thrown out) in a five-point game — with incentives. The five points are awarded for the following: the low player on the hole gets 2 points, low team gets one point, approach shot nearest to the hole gets a point, and any birdies on the hole get a point. The game includes incentives of points for chip-ins (called chippies), putts of any length longer than the flag pole (polies) and “sandies” for getting up and down from a sand bunker. The captain also has the opportunity to be a “lone wolf” and go it alone on a hole (one player versus four) if they really like their drive. And there is even a rule allowing for a “divorce” if the player picked by the captain doesn’t want to team up with the captain — that player must then take on the other four players. There’s plenty to keep track of here, but plenty of fun and exchanging of “points” afterward. This game is played with a deck of plastic cards that can be purchased online. Here’s an overview of how the game works. Click here for the complete rules. Players select one person who will manage the dispersion of game tags (the Zoo Keeper), as well as decide when the game ends, typically every 9 holes or until dark for twilight rounds. Typically played as a wagering game, players agree on the penalty value of each game card before beginning play. Value these cards using money, a round of drinks from the player having the most cards at the end of the game, food, or anything else you decide. Tags can also have varying values, so be creative! During play, a player receives the card that matches the hazard or pitfall when the player makes a golf stroke resulting in an event described on the game card. It is possible and common to receive more than one card resulting from the same stroke. A player receiving any cards keeps them in their possession until another player incurs the same hazard or pitfall. Game cards pass from player to player every time their associated hazard or pitfall is incurred, even during play on the same hole. At the end of the game, players holding cards must “pay up” according to the rules set by the group at the start of the game. Players with the fewest cards wins! Have an Even Number? Play Fourball! And finally, in honor of the Ryder Cup, that was recently contested (and lost by the Americans) in France, trying some games of Fourball and Foursomes might liven things up. In Fourball, two-player teams compete against each other with the lowest score recorded on each team counting for the hole. And to change things up, on the back nine, you can play Foursomes, which entails the two players on a team hitting alternate shots on each hole — lowest score wins the hole. Foursomes always make for some interesting situations and teamwork (just ask Tiger and Phil). And at the end of the round, you can drink your favorite beverage from “a cup” at the 19th hole. So, whether you play a normal round or add some fun to it, you’re sure to have fun at the course.